What you’re about to read is a sad story, albeit with a happy ending. When issue #131 arrived, I was excited to see it contained the first superhero crossover in what I shall dub the Julie Schwartz universe. I had begun seeking out other Schwartz books, and Green Lantern with the matchless Gil Kane at the artistic controls and John Broome on board for the writing soon became a book I looked for on my comic book safaris. And therein lies the sad story. I would only find GL, if I was lucky, when I tagged along with my folks on their Saturday excursions into town. When I opened this Flash issue, I saw Barry Allen and Hal Jordan sitting on a park bench chatting like they were old buddies, like they’d met before, and they had in issue #13 of Green Lantern. With no GL subscription, no car, no comic shop, no comic cons and no internet, I was up the creek without a paddle as far as finding the GL book was concerned. It was a classic case of continuity interruptus, which, as we all know, can leave you feeling rather unfulfilled. The good news is that I was finally able to read the GL story in an archive edition a few decades later, but that’s a heck of long time to wait for the climax other shoe to drop. One other thing concerning the bench scene, there was something about it that really resonated with me. I was really quite charmed by the scene and I can’t explain exactly why, but the sight of the two friends sitting there talking struck a nerve. It wasn’t until seeing it again that I wondered if the memory of it had been stashed somewhere in my subconscious when I placed two friends, Les and Lisa, on a park bench in the teen pregnancy story arc in Funky. Maybe. In a way, I kind of hope that was the case. The Flash #131 and the opening bench scene. 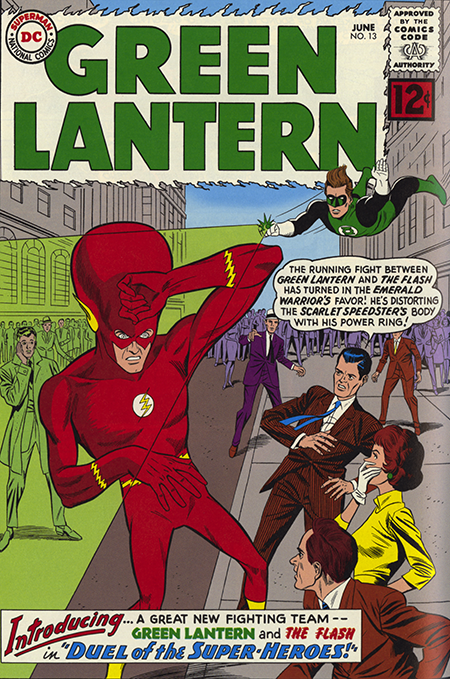 After they leave the bench, Barry and Hal head into a department store to find Iris and Hal’s heartthrob Carol Ferris. While there, they see a charity booth raising money for orphans like Little Orphan Annie, and by the booth are life-size mannequins of Green Lantern and The Flash. As we all should know by now, mannequins in the first act always man-up in the third. The couples return to their vacation only to be interrupted by a flying saucer. Okay, I’m totally on board with suspending a certain amount of disbelief, but two alien invasions on the same vacation seems a little excessive. 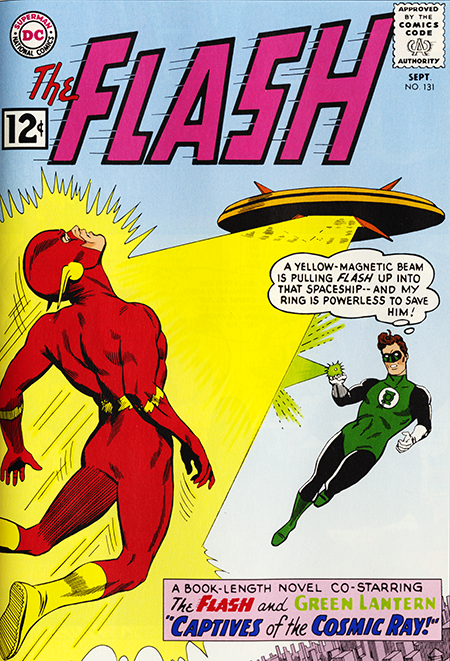 Nevertheless, Hal and Barry change into the Flash and Green Lantern (did I mention that and the end of the GL book, that Barry, just to be fair and square, reveals to Hal that he’s the Flash? No? Sorry.) So anyway, the saucer captures the Flash in a tractor beam and GL gives chase. They end up on a barren planet that’s empty of everything but alien menaces. They defeat the aliens and, when they return to Earth, they find that the whole alien planet thing was a ruse to get them off our favorite planet so that alien from the Myrmiton star cluster could take over the Earth, or, again, at least the west coast. The aliens take GL’s ring and strip the Flash of his powers with a radiation beam or so it seems… because just before that happened the Flash zipped in to the department store to the mannequins (ta daa) grabbed the fake GL ring and substituted the Flash dummy for himself. They then sit down on the bench again where the Flash tells GL what he’s done. Meanwhile, the Myrmitons find that the ring they have is a dummy (sorry) and they look out the window of their headquarters to see the Flash and Green Lantern charging up the hill towards them. It appears that the two heroes are stopped by an invisible barrier, but it turns out that they’re just the mannequins (double ta daa) being animated by GL’s ring, while the Flash and GL tunnel under the headquarters the invisible barrier doesn’t exist. Another nice bit of writer Broome’s cleverness. With the Myrmiton’s defeated, the vacations resumes and all ends well except for a few Myrmitons who are kept as hostages to ward off any more attacks. GL says they may allow the hostages to return home if conditions warrant, and, since we’ve never heard from the those Myrmiton rascals again, I think we can safely assume the hostages have long ago been sent home.